Fortune is an extra ordinary dishwashing detergent made for automatic dishwashers. 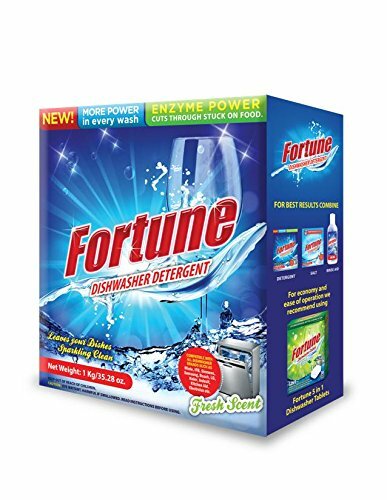 Now fortune dishwasher detergent has the power of enzymes. Our new formula thoroughly removes the toughest of stains such as tea and coffee, dried on food and grease. Dishes, glassware come out spotless clean!! Specially formulated for Indian style of cooking. 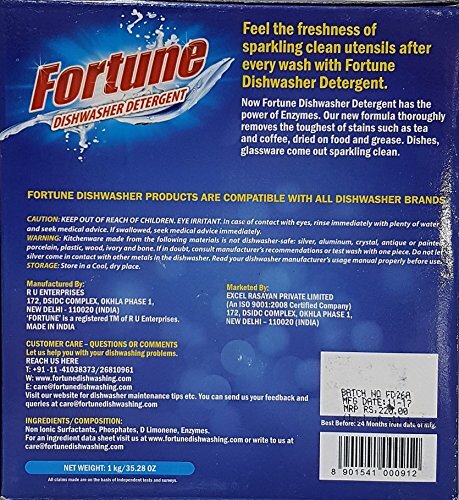 Fortune dishwasher products – detergent, rinse aid and salt are available in the Indian markets for over a decade now with fortune dishwasher tablets being the latest addition. The Indian style of cooking is a lot different from western countries. Our products are specially made for India. Our customers rate our products better than the traditional leading imported brands available in the market. Our product is well accepted and is compatible with dishwashers of all makes. Directions: scrape your dishes of excess food before loading the dishwasher. Fill the detergent dispenser up to the 20g mark (approx two teaspoons). You will have to add more detergent depending on the water conditions. In hard water areas use more dishwashing detergent. If you are getting residue on the dishes reduce the amount of detergent. You may also find that using fortune rinse aid helps with this issue. Run the machine according to the manufacturer’s instructions. Optimal water temperature is 50-60 degrees Celsius. If you live in a particularly hard water area then it is recommended that you continue to keep your dishwasher topped up with salt.